Bob Gerau spends every Fourth of July surrounded by fireworks, yet he seldom gets to see a single dazzling shell streak across the sky. For the past 51 years, Gerau, owner of Bob’s Fireworks, has spent the Fourth, along with his kids and grandkids, selling fireworks until midnight out of the family’s three yellow and white tents at strategic locations around town or out of the warehouse near U.S. 63 and Deer Park Road. 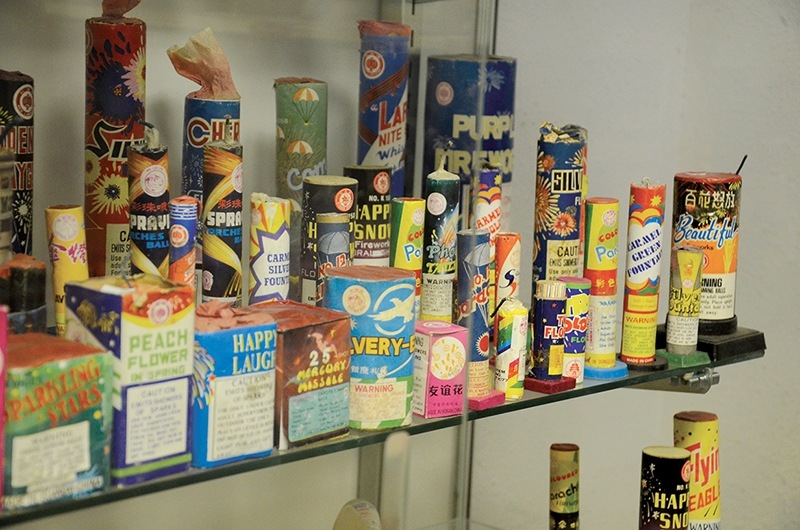 The hub of their fireworks enterprise — colorful quotes and vintage posters festooning the walls — also houses Gerau’s personal collection of antique fireworks in six glass-display cases. By the time the family heads home at the end of their busiest day of the year, they’ve had more than enough fireworks for one day. Despite the stress of the day, Gerau retains his passion for fireworks even after all these years. He recalls fondly the single bag of firecrackers his family shot off each year to celebrate his father’s birthday and Independence Day in south St. Louis. Gerau’s family moved to Columbia in 1955 when he was 15. He’d sell a handful of fireworks to neighborhood kids from time to time. But 10 years later, Gerau stumbled across a small fireworks stand on Paris Road operated by a friend. “He could make good money in a short period of time,” says Gerau, who was delighted at the possibility of converting his love of fireworks into his livelihood, too. With the support of his wife, Audrey, he opened his first fireworks stand with just enough merchandise to fit in the trunk of a car. Now, he estimates they have 25 containers, all 48 feet long, and all full. Sometimes, customers stop by who remember him from their childhood as the firecracker man who gave them toy tanks or chickens. Now, he gives those same toys to their children and even grandchildren. Over the years, Gerau says fireworks have evolved from the single-shot firecrackers he and his friends would bike out to the outskirts of the city to shoot. “[They are] bigger and better and prettier,” he says. Gerau’s son-in-law, Dave Rasmussen, tests each firework variety they sell before adding its description to their catalog. Current customer favorites are the “1942” with 201 shots that crackle and fill the sky with crossettes that burst into vividly colored comets, as well as the Snowblind cake with 64 shots that explode loudly, releasing thick orange palms and glittering stars at the end. “There is a mystic to fireworks,” Gerau says. “People are into looking at as many effects as you can get” — crackling, multi-colors, loud noises, strobe lights and combinations of all the above. Though it’s impossible to pick a favorite — he loves them all — “a real intricate doily effect” that he saw a few years ago did turn his head, Gerau recalls. He gets his “fireworks fix” from the seven or eight firework conventions he attends each year, where he likes to trade antique fireworks with other collectors.